It has been a while but I made up an npw9 3.5 with lines and handles last week. 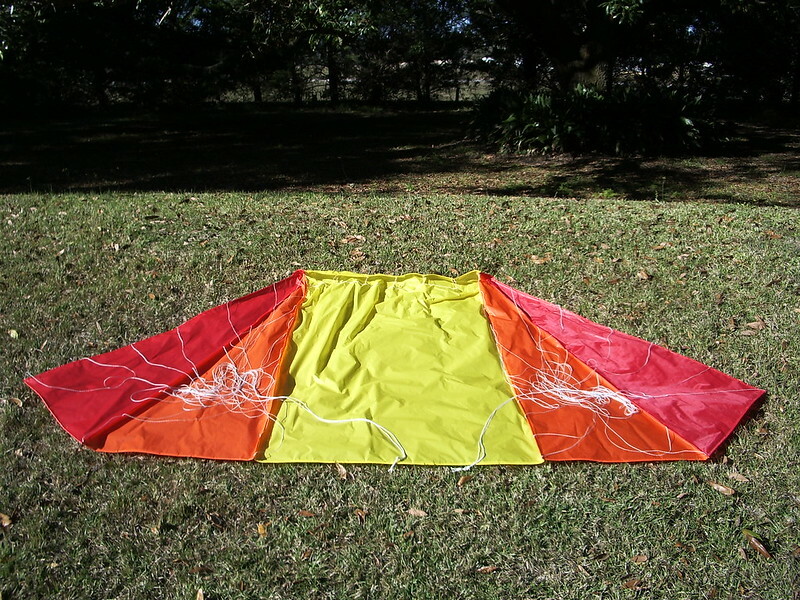 Here is a picture of the kite. Good to see you are back! Nice colors. Here is my latest project - 3.0 M gkite prototype plan I modified. It is a 7 cell single skin foil. Rather than making a wrap around leading edge (akin to a closed cell foil) I left the leading edge open. This makes the sewing far easier, and Peter Lynn seemed to suggest in his newsletter a while ago, the wrap around may not add all that much performance. It seems to fly quite well, with minimal bridle adjustments. Based on today's small but windy sample, it flies as well or better than my best NPW's. Once all the templates are made it is really easier to build than a NPW. Still might do some more bridle tweaking. Here is a photo prior to installing the bridles. I'm working on a video. I am working on a depower nasa wing. I am about to start to bridle the kite. Not sure when I will be able to fly it with the weather being so bad. I will keep everyone informed on my progress. That would be great. Anxious to see what you have. I just saw the extended weather report. I thought that it was cold now. Next week even colder. It looks like it will be several weeks before I can take the kite out to check out how it flies. 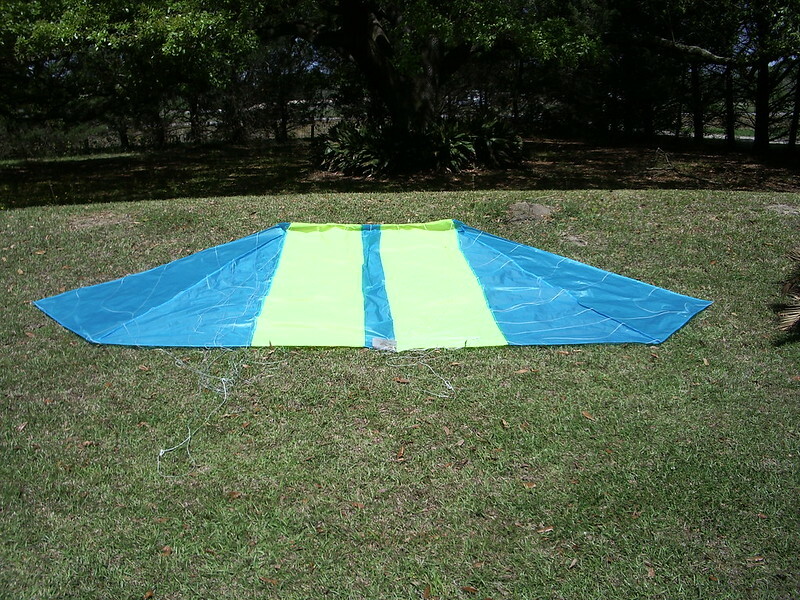 I built another 3.0 m g-kite, but this time using 3/4 oz fabric (instead of Dollar Tree Prototarp). Certainly helps if get flying in less wind. Otherwise seems about the same. Have some tweaking to do. This video was yesterday in some pretty light winds. I like this design - trying to figure out what to do next, though I'm probably going to try it with my buggy before deciding. It requires a sensitive touch on the brake lines, so I might try a z-bridle. Very cool Randy... looks like it flies like any other foil yea? Not as fast as most foils, but has a lot of pull and I think a pretty good window. We'll see how it works with a buggy soon I hope. Sewing done - onto bridling. That's a beauty Randy, funny I was fixing my 4m last night ( I hit a parked tractor trailor ) and wondered if stiffeners in the LE would widen the window any? Now I'm going to find out. Thanks in advance for the review. Ps it really was just a small tractor trailer. Thanks Ed. Ian (BigE123) used to swear by nose stiffeners made with lawn trimmer line in his NPWs which is what I used this time. He also used trimmer line I think in his single skin foils as well. It flew "right out of the box", though I tweaked the bridles a bit which seemed to help the window a lot. Flew in very light wind initially so that's good. It flies quite differently from the earlier version (w/o the full leading edge.) This one flies much like a foil kite - brake pressure not needed, while the other versions required constant brake pressure like an NPW. I flew it briefly on a 2 line bar (something I could never get right on the other versions.) So it is promising so far. Her are a few pics - video will be forthcoming. Really want to see how these do with my buggy. My sewing machine has been busy - esp. because there has been a lot of rain lately and not that much wind. So I modified the g-kite design again. This time I kept the same panel shapes but replaced the 6 full ribs with 13 partial ribs. My reasoning was that on the g-kite, it appeared to lose its window as the wind increased because the leading edge flattened out. However, it seemed also to me that the panels already had a continuation of the airfoil shape from the partial rib to the trailing edge built in so, just like in an NPW - the bridles could provide shaping. (Plus, I saw other kites done that way.) The bridles ended up (after accounting for the amount the rib was providing) the same, except I replaced the 2 brake lines with a single line brake for bar flying. Unlike the original g-kite plan, which required no brake pressure, this version must have constant brake pressure, which the 3rd line brake/safety provides. This one flew pretty much right out of the box. I have some tweaks to do, mainly I was guessing at the brake lines so I need to get those adjusted a little. I was pleasantly surprised that it seems to fly better than the g-kite in terms of speed and window size. Though it it possible the wind changed when I went to the g-kite. I figured my usual buggy spot was going to be way too muddy so I went to my lake spot and landboarding. Rode for about an hour and a half so I ended up pretty happy today. Cool Randy! Did you modify the ribs on an existing kite, or did you sew a whole new one? Thanks. I sewed a whole new one. My thought was that sewing would be a lot easier with only the partial ribs, though the leading edge is by far the hardest part of the sewing and I added 7 more ribs. On the other hand, it takes a long time to prepare the full ribs - they have to be hemmed and you have 2 or 3 bridle attachments to sew into place. Of course they also have to be sewn into the wing. So ultimately, I think this kite is probably easier to build. My latest kite. It is a npw9 7.6 meter in blue and yellow. Here is a picture. Beautiful work as always! How is the depower NPW coming? Slow. I need to finish it. Not much left to do on it. If anyone remembers this kite, I have modified it. It was a basic single skin, but I didn't do a wrap around leading edge. It flew well enough but simply wasn't good enough to use with my buggy - a bit too twitchy, and not enough window. I added the wrap around leading edge in some subsequent projects and they flew better. Lately, I've been interested in seeing how spars improve kite performance so I added a spar to the leading edge of this g-kite. It seems to fly much better and despite the added weight of the spar it seems this kite takes very little wind to fly. The LE will still collapse but not nearly as often as it did before. Here are some pictures from today. I shot some video but it was too cloudy to see it that well. So I'll post that later. I think the only thing left is to try it with the buggy.